Our organization is actively engaged in supplying and exporting fully husked coconuts to the clients in india and the subcontinent. We acquire fully husked coconut from the well-known coconut cultivators who can assure of their high quality. Our fully husked coconut is germ free and is stored in completely hygienic conditions. We are offering semi husked coconut 500gm above, packing is customer requirement.we grade each nuts.colour -biscuit, 15days to 30 days kasangal. We are known as one of the prominent Suppliers and Exporters of Semi Husked Coconut in Tamil Nadu. The highly nutritious and sweet Semi Husked Coconut, offered by us, can be used in several dishes and can also be eaten raw. 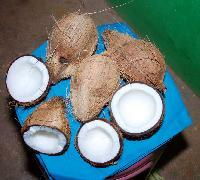 We acquire Semi Husked Coconut from the most reliable cultivators.